A group of thirty-three students and three teachers from Paz de Ziganda, Pamplona, Spain are visiting Bishop McNamara High School this week. This is part of the 8th Exchange Program 2018-2019 that we started 10 years ago and this year we are co-hosting with St. Mary's High School of Annapolis. Fifteen (15) of these young men and women of Spain experienced the "Mustang Life" in our classrooms, hallways, Mona Student Center, sport games and even at our Back-to-School Dance. This year, to promote this incredible period of time between both exchange schools, we created the campaign "Celebrating 10 Years of Friendship." We also created the hashtag #BMHSExchange to keep the communication active with all of our participants. We invite all the former participants to join us sharing your past experiences, pictures, comments or just a simple hello supporting this activity. The entire group visited Philadelphia with their McNamara hosts on Wednesday, September 12th and they will continue visiting the metropolitan area during this weekend and into next week. The Spain Exchange is part of the multicultural events planned by our department of Modern and Classical Languages to enhance the educational experience of our students. For more information about the Spain Exchange and how you or your student may participate, contact Mr. Luis Duclos at Luis.Duclos@bmhs.org. 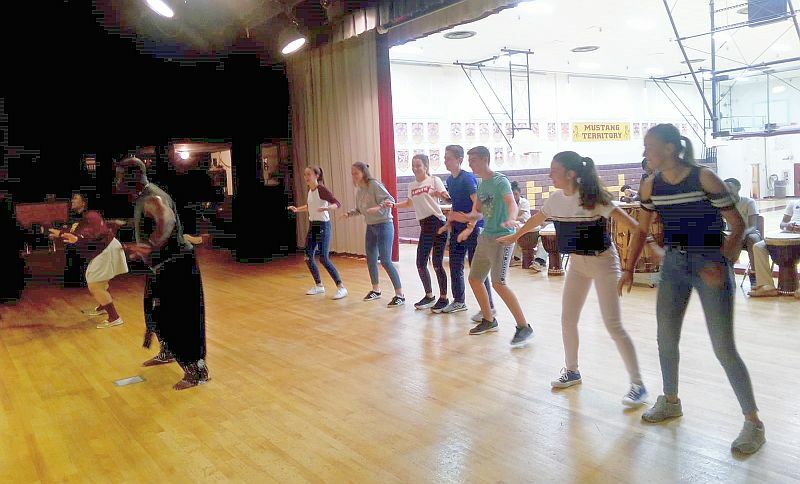 Spanish students perform typical Basque dance.